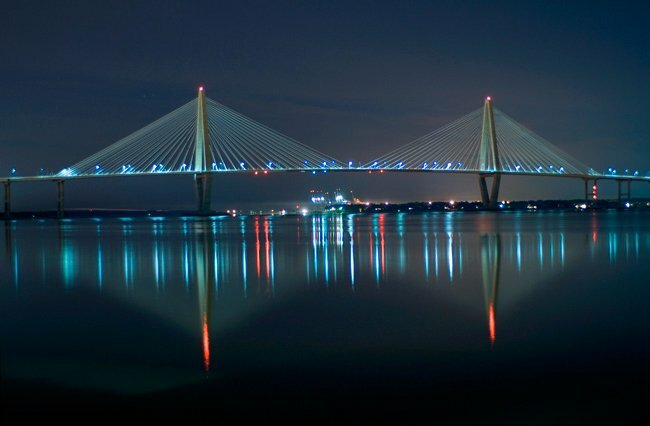 The Arthur Ravenel Bridge opened during a week-long celebration in July 2005. 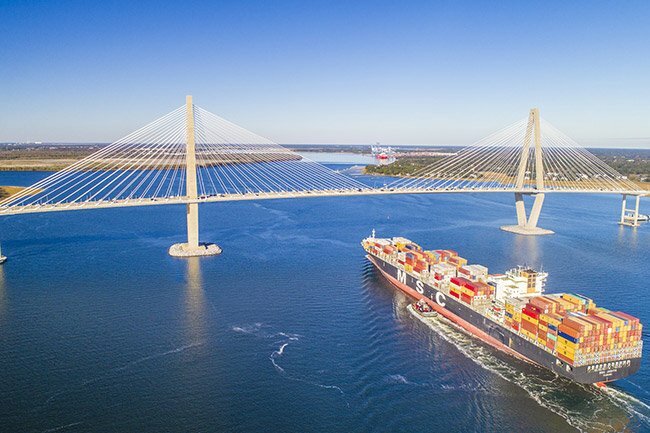 This eight-lane, cable-stayed bridge with two diamond-shaped towers allows clearance for modern ocean freighters to access the port of Charleston. 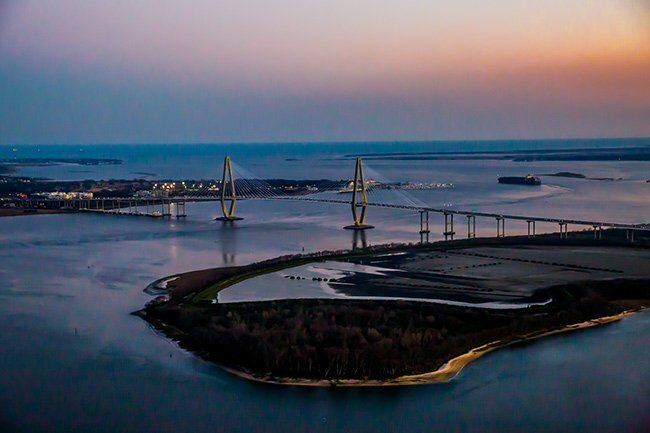 Its predecessors, the historic Grace Bridge and the Pearman Bridge, were a beloved part of the Charleston skyline for almost 80 years. Over time, however, they became obsolete and unsafe for travelers. 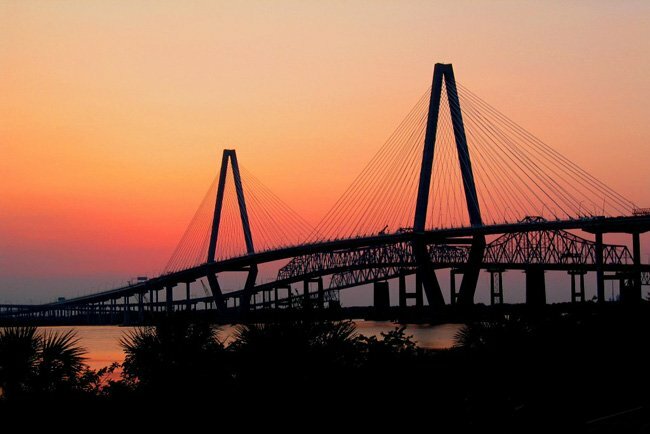 Charleston politician Arthur Ravenel spearheaded the campaign for a new bridge to be constructed over the Cooper River, replacing the old bridge. 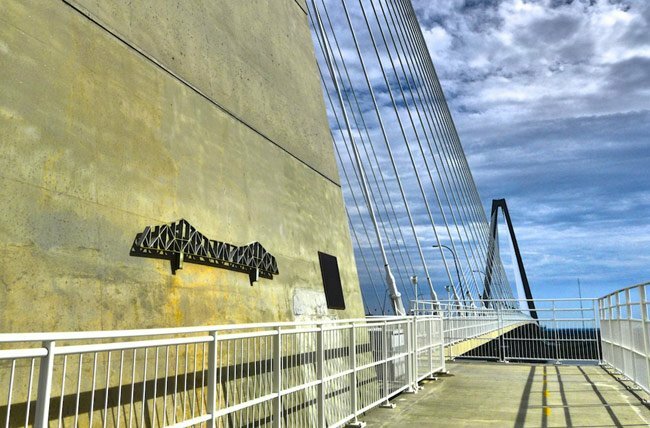 The new bridge provides more than traffic relief to residents – it also has a bike and pedestrian lane, and the world-famous Cooper River Bridge Run is held here every year. The Grace Memorial Bridge was known fondly (and also somewhat fearfully) by locals as the “Old Bridge.” Its two narrow lanes (10 feet each with no curbs or median) opened for traffic on August 8, 1929, as a toll bridge costing 50 cents per trip. 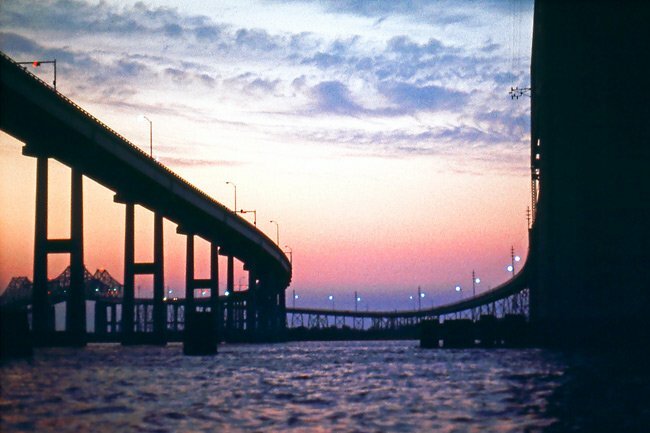 This toll was used to pay for the bridge’s $6 million price tag; it was owned and operated by a private company named Cooper River Bridge, Inc. The president of this company, Charleston native John P. Grace, later served as its namesake. Prior to 1929, people needing to travel between Charleston and Mount Pleasant did so by private boat or ferry. 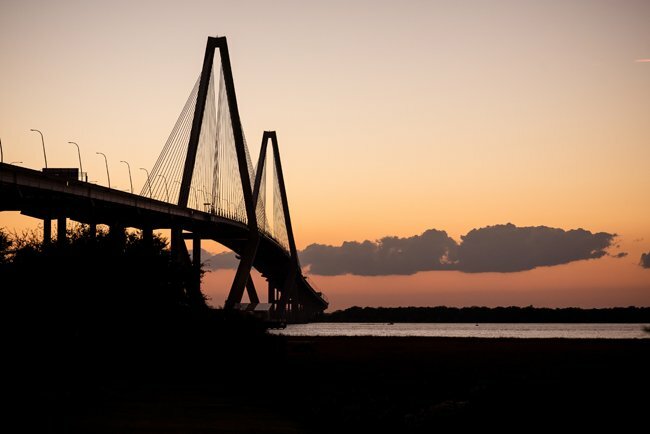 The bridge actually crosses two bodies of water – the Cooper River and Town Creek. In all, its length measures 2.71 miles; it is 15 feet higher than the Brooklyn Bridge in New York. 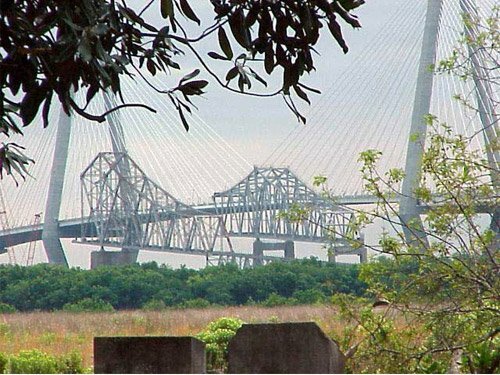 At the time of its construction, it was the largest bridge of its kind in the world. 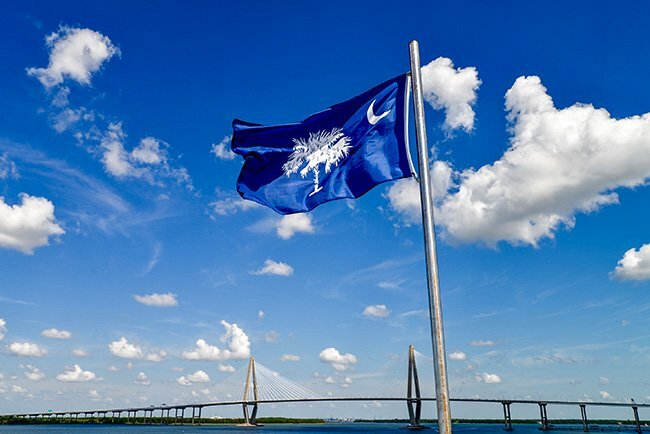 27 years later, in 1946, the state of South Carolina purchased the bridge and eliminated its toll. As it happened, a 10,000-ton freighter named “Nicaragua Victory” rammed into the bridge that same year. It ripped out a 240-foot section, causing Elmer Lawson and his family to fall into the water below. 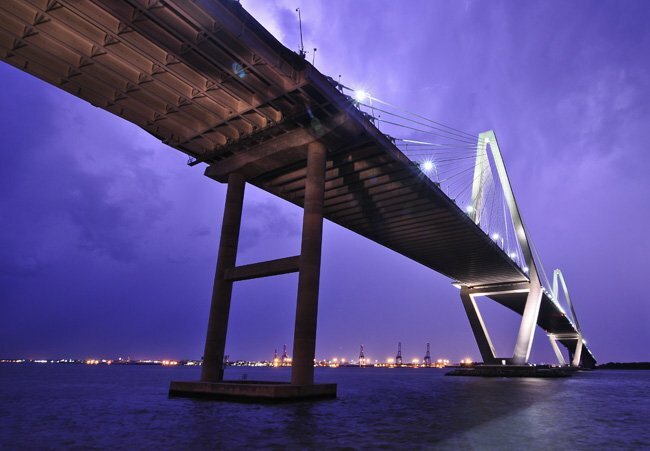 How much money was saved from the original budget of the Ravenel Bridge? Thanks! I have to go to MUSC every monday. Hi, Pat. You will need to contact the photographers themselves via their websites. Most can be reached through links by clicking on their names beneath their photos. If there is a photo you wish to use and the photographer does not have a website, please let us know, and we will try to get contact information to you. Good luck! How do we get consent to use any of these superb photos? If you have a chance, park on the Mt. Pleasant side by the Visitors Center. 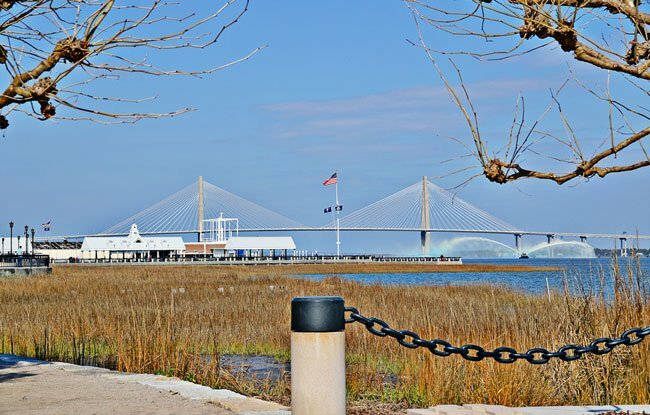 I am 68, and I absolutely love walking the bridge! I could be a POSTER CHILD for walking it. But I more like senior SWAG. My longest walk was a cold January day. I prefer cooler weather to walk the bridge. I put in 14 FITBIT miles. Like Forrest Gump, I kept on walking, until I noticed the impending sunset. I love the fact that you can walk across. I walked accross the bridge in Little Rock by the Clinton Museum, and enjoyed it so much. I am hoping I will get the chance to walk across this one. It is a very impressive bridge. Being MUCH wider than the two older bridges, Kathy, the new bridge is much less scary! In fact, I don’t find the new bridge scary at all. 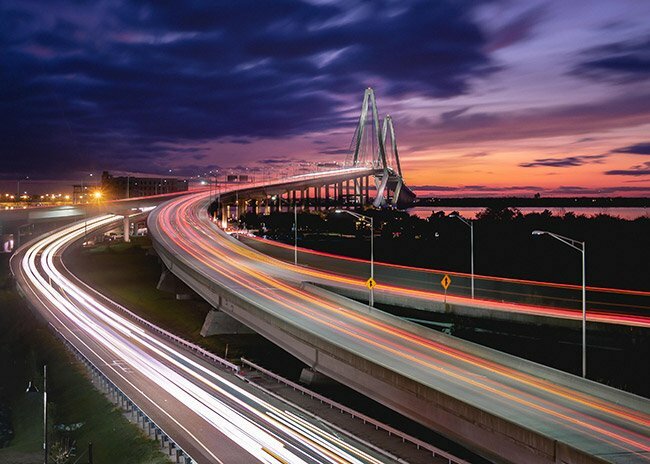 And I think we all probably agree that the new bridge is much more beautiful to look at. 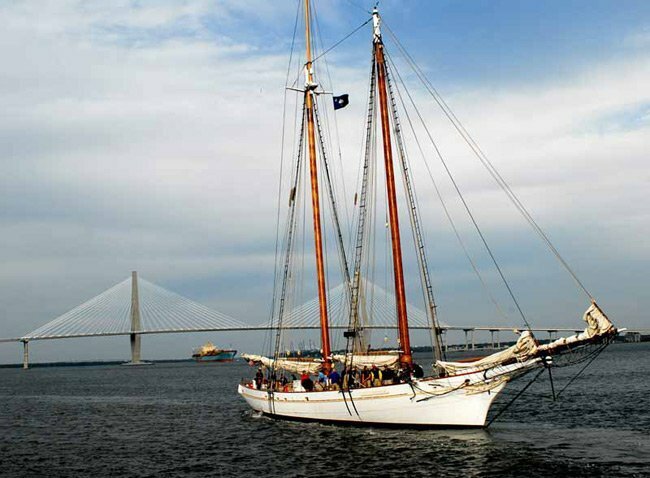 I love Stephen Faucette’s picture above, too, of the white, gaff-rigged (and I’m guessing, wooden?) schooner – reminds me very much of the one I lived on with my family-of-origin from Autumn 1974 through Spring 1977, when I was a teenager. 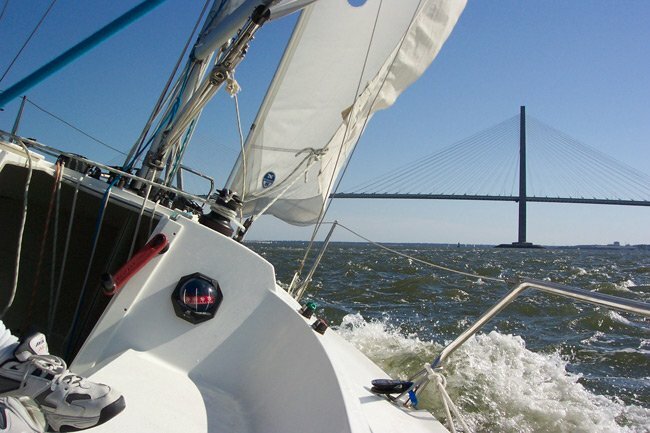 Navigating the Intracoastal Waterway as we came down the East Coast from Maine, in Autumn 1975, was the first time I ever visited Charleston. Moved here in the late-1980s and have been here ever since. 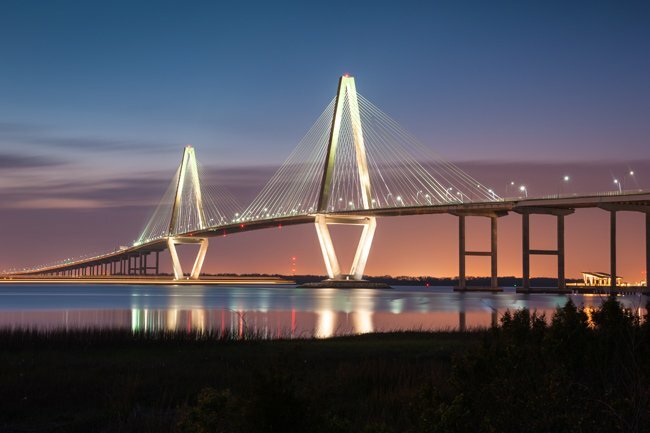 The bridge was built by Palmetto Bridge Constructors, Inc., a design-build firm, with Parsons Brinckerhoff of NYC as a design partner and with consulting by MacDonald Architects of San Francisco. 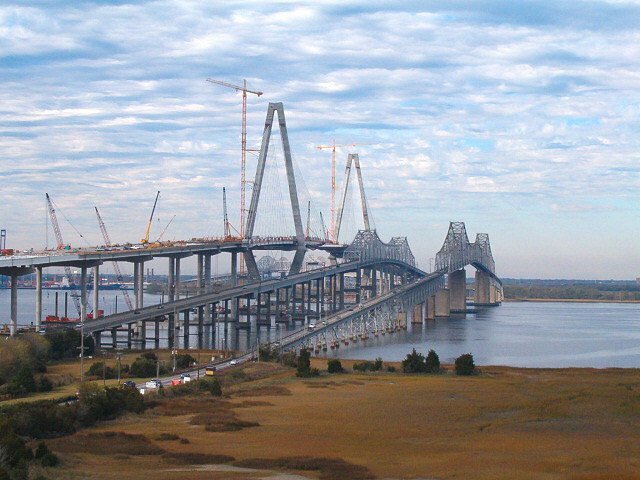 Other details are as follows, according to Associated General Contractors: Eight 12-ft-wide traffic lanes; 1,546-ft main span; 5 75-ft-tall towers; road deck rises 200 ft above the median high-tide mark; 128 individual bridge cables; cables formed by 90 seven-wire strand, each cable holds more than 1 million lbs. ; white pipes range in diameter from 12 to 20 in. 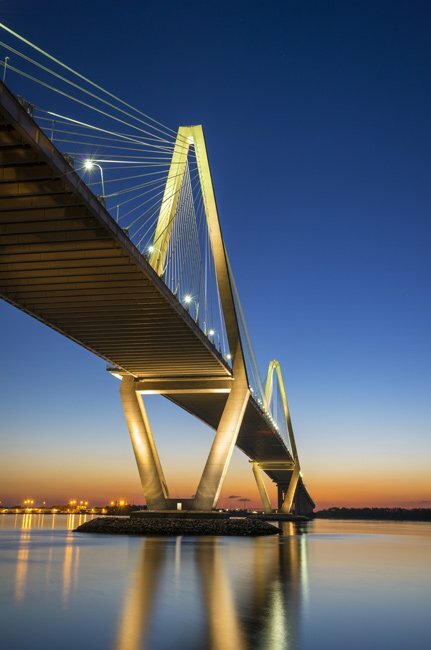 ; 12-ft bicycle and pedestrian lane; 300,000 cu yd of concrete; 50,000 tons of reinforcing steel; 40,000 tons of structural steel; more than 400 drilled shafts . How long did it take to build? Total steel and wire weight? Total concrete weight? Bridge type? Engineer? I had relatives in both Charleston and in Mt. Pleasant. I went across the bridge a lot as a child and was always afraid of it. 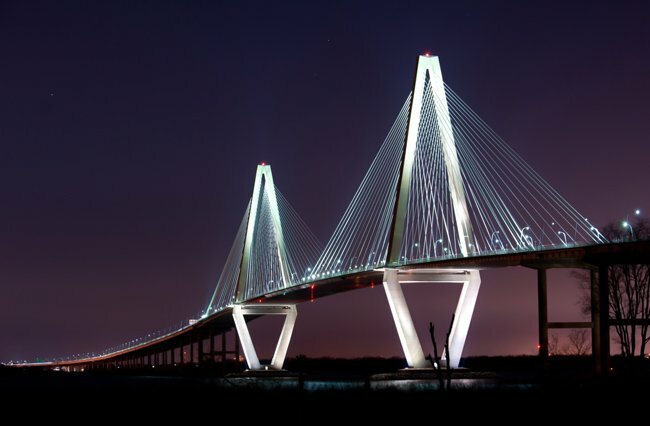 The new bridge is nothing like the old bridge, I think it is simply awesome! You really should give it a try. My family and I lived in Charleston from 1959 through 1963. There was just one bridge then. It was kind of scary. 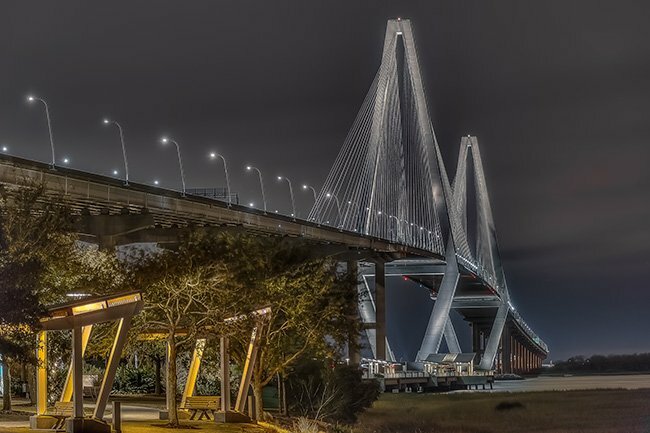 The new bridge is beautiful. I have never been across it and I am not sure if I want to. That’s awesome that you were part of the construction crew that built the bridge! I worked in healthcare construction for a number of years and understand the experience of building something that will be with a community for many years. 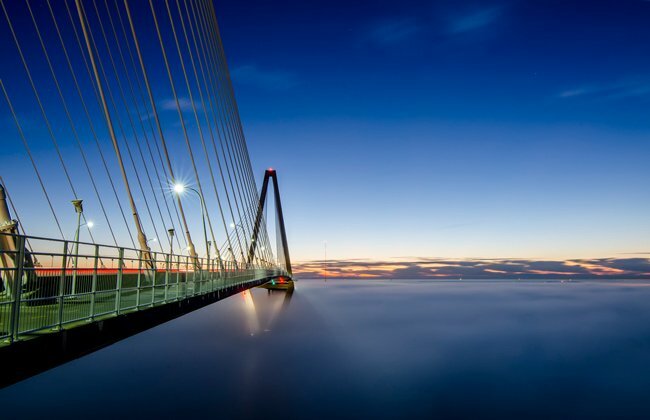 If you’re interested in purchasing a photograph of the Arthur Ravenel Jr. Bridge I have several in my gallery at Fine Art America: http://fineartamerica.com/profiles/mark-vandyke.html. The site includes a 30-day money-back guarantee on all purchases. Happy Holidays to you and your family! 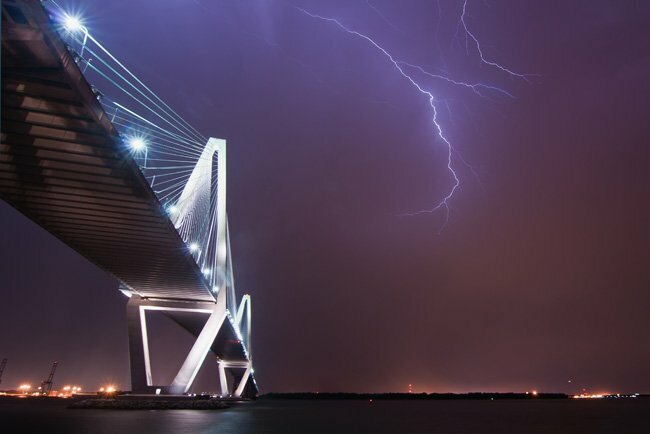 Where can I get picture hanging for my wall of the Ravenel Bridge? I was a construction worker on the bridge. Needless to say, it was quite an experience. Wonderful pictures of the new bridge and nice to see the links to video and pictures of the old bridge as well – glad to see this up here, showing the history of the area, old and new! 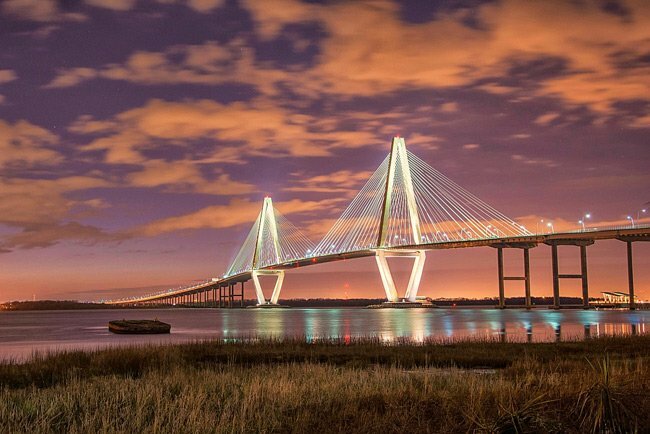 I just love these pictures of this bridge — very beautiful!